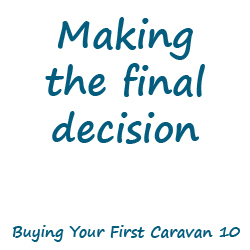 Welcome to post number 9 in the “Buying Your First Caravan” series. Today the topic is things you should look out for when viewing a caravan you are thinking about buying. Does the caravan have a service history? When a caravan has a service, as with a car, the owner is given an invoice / results detailing the work results of the service and if there is a service manual this should be stamped. Ask to see any service history that the caravan has as this will aid you in your further checks. Has the caravan had any repairs? Ask the current owner / dealer if the caravan has had any repairs that have been carried out in the past. You may not always get an honest reply, you can sometimes learn of repairs from receipts in the service history. Why is a repair a problem I hear you ask, well its not always an issue but if the caravan has had a damp repair then you want to make sure you know where the problem was and by whom the repair was carried out by. Also you will need to know if the repair is still under warranty. A damp repair is a very hard thing to undertake, and in experience they are rarely permanent no matter how skilled the workman who carried out the repair was. Something to bare in mind. Similarly with accident repairs, you want to know if the work is under any kind of guarantee. Does the caravan have existing finance on it? To sell on a vehicle that has existing finance on it is wrong, I am no legal expert but I do believe it is against the law. You may think that it is responsibility of the buyer but you would be wrong. If you were to buy a caravan with existing finance on it and the finance company found out, they are within their legal rights to repossess the vehicle from you without any compensation. This obviously ends very badly for you as you are left with no caravan and no money. 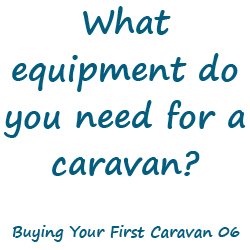 You should ask the seller if the caravan has finance on it, but I would still recommend doing your own checks. You can do this by calling HPI on 01722 411 430 and paying them £14.95 (correct at the time of writing) and quoting them the CRiS number of the caravan (17 digit number etched on the bottom corner of each window), they will then be able to tell you a number of different things including; any outstanding finance and if it has been reported stolen. This may seem like a lot of money but it could potentially save you thousands. Does the caravan have a damp problem? NOTE: Inserting the damp meters prongs into rubber seals or against metal will give a high reading that does not reflect water content, do not be confused by this. Only insert prongs into wood / wall board. Smell – The smell of a caravan is the first tell-tale sign I notice when walking into a caravan. Moldy smells often indicate there may be some damp which by this stage is normally quite extensive. Also take note of any pleasant overpowering smells that may have been created in the caravan to cover any nasty smells. Spongy walls & the knock test – Caravan wall board should not be spongy, if it is, its likely that water has gotten in. A simple test I use is to knock on the wall board, if it makes a dull thud then you should inspect this area further. If it makes a normal bang sound then move on. Different wall board – A trick some dodgy traders may use is to place a different colour wall board over the existing damp one. If you are looking at caravans older than around 1995 the chances are it will have some damp somewhere. You just need to make sure there is as little as possible if it is going to last you any length of time. 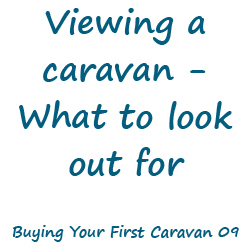 in addition to the main points above there are a number of other things I would recommend you look out for when viewing a caravan. Now many of these are more aesthetic than practical issues but I wanted to mention them as they can be costly to put right if they are a problem for you. Spongy floor – If the floor in the caravan is spongy it has fallen into the nasty grasp of delamination. Delaminated floors can be repaired by inserting expanding foam into the floor that hardens to reinforce the floor. Beware of any carpets or cardboard that has been laid in areas of the caravan, remove it as press firmly on the floor with your foot to test. People will often try to hide this problem by covering with mats and cardboard. Blown / cracked windows – You will if a window is blown because when you open it and look at it from a side perspective it will be swollen. The swelling of the window will then gradually pull the window away from the seal and allow water to penetrate, this is a common cause of water ingress. The cause of a blown window is normally because of a creeping crack on the window surround. Replacement windows costs anything from £100 right up to over £600 to replace! 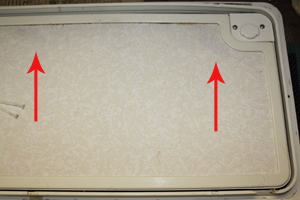 Cracked sinks and shower trays – Another common issue in used caravans is that the shower trays and sinks get brittle. It only takes for something heavy to fall onto the surface of them and they will crack. They are costly to repair or replace and cracked shower trays can potentially expose the floor beneath to damp. Splits in taps and shower heads – This is an important one to look out for. If either the taps or shower head is cracked it may be that the caravan was not drained down over the winter, this means that this is potentially just the tip of the iceberg of the frost damage. Ask to see the water tank (if it has one) and water heater to further inspect for damage. Holes in worksurfaces – Caravan worksurfaces have to be light weight and so are manufactured hollow with some reinforcing corrugation inside. If something heavy like a can of beans falls out of the cupboard while travelling it could easily put a hole in it. Replacing the worksurface is pretty much out of the question as it would cost a small fortune. Repairs can be done but you will always be able to see it. I have seen on a few occasions where a pretty tile has been inserted where a crack was to make good of a bad situation, very nice! Out of place stickers – If you notice strange and out of place stickers on the outside of the caravan this could indicate that there are holes that are being obstructed from view. This is a major problem as water can easily find its way into the caravan and become a serious damp problem. Inspect further if this is the case. Okay so to recap, we spoke in detail about what you should look out for when viewing a caravan you are thinking of buying including; damp service history, damage and existing finance. Do you have any questions about viewing a caravan? Ask me in the comments section below, I’ll gladly advise you as best I can. You might also want to take a look at this post I wrote on 100 things to check when viewing a caravan. As we will be moving to the 10th and final post tomorrow I hope you have learned enough to be able to make an informed decision as that is exactly what it is about; making the final decision. I am looking to purchase a used caravan. I only have £500.00 budget….I know this wont get me a tip top van but I want a very tiny lightweight van something up from a freedom caravan. My husband is poorly so it will have to be something small for me to tow and man over. I have seen one but it has a long dent on the outside and when looking inside has a long crack in the wall, have been trying to figure out what it could be, Could do with some advice ……I live in Clevedon North Somerset. The crack in the wall would indicate to me that the caravan may have been involved in an accident at some point. I would stay away from it personally. Anything you buy for £500 will have something wrong with it but you can find better than an accident damaged one. Hi, we are looking for a caravan for our journey to Europe for a year. We have a budget of £2000 however I have been disappointed in what I have viewed in our price range so far, some of them dripping wet!! Anyway we went to view a refurbished caravan recently, new carpets, reupholstered seats, new curtains, resprayed, reinsulated and new wall linings. I really liked it, it didn’t have an unpleasant smell like all the others we had seen, it felt relatively clean/fresh, walls felt hard etc. my concern with a refurbishment is if it has been done properly I suppose. The private seller who did not do the refurbishment stated ‘has NO damp’ on her listing however after turning it upside down a little bit we found 2 quite large wet patches in the bottom left hand cornors at the front and the back under the seats. She said she wasn’t aware of this damp. I was wondering how damp in that area usually happens? Am I right in thinking that if it is wet that it is relatively new damp? The van didn’t smell apart from when you put your nose right up to these areas. Is this likely to be an expensive job and what are the risks? First of all, congrats on your planned 1 year trip around Europe. I know it is a dream many people have so I’m sure you’ll have many envious fellow readers of the blog. Regarding your questions about damp, the area that you found it in is a common place for caravans of that sort of age. The water typically comes in through perished seals in the awning rail or under the windows. The fact that it was wet would not necessarily indicate that it is a new problem, only that it is current. If the wall board is spongy this would indicate that the damp has been there for some time and that the wall board and possibly the stick work has stated to rot. If the wall board is still solid to touch it is fairly recent and could potentially be cured. But if the seals are perishing in one place it is likely that they are in others too and only a matter of time before more water makes its way in. If the wall board is still solid then the repair is reasonably straight forward, it would be a case of finding the source of the leak and revealing it, then using an industrial dehumidifier to draw out the water. If the wall board is spongy and the caravan is under £2,000 it would probably cost more than the caravan is worth to put it right. I hope this helps, and I hope you have an amazing trip. Keep us posted on the way if you can! Hi Josh, your comments are very helpful, as newbies to caravans we are relying on your advice. We are considering importing a new or newish UK caravan into NZ. Does your firm do this? Could we purchase from you? Regarding secondhand caravans, We are aware there are some makes and models that are best avoided , can you tell us which ones to cross off our list? Thanks for your praise. I’m just glad to help! Yes, my family company would certainly be able to help you with that. You can get in touch with the sales dept there at sales@stowmarketcaravans.co.uk. To be honest, there really isn’t any makes I would say to stay clear of. If you are buying through a dealer you can generally rest assured that everything will be okay with the caravan. I wonder if you could advise me please. I have a caravan that we regularly use that is quite an old one. I think it’s about 1992 I think. We have had new curtains fitted, replaced the carpet and I’ve had the cushions professionally cleaned. It’s immaculate and we use all the facilities so I know they all work. We are looking to sell it but I seem to have a dark patch ion the wall in the bathroom area. It has been there for the last two years (since I’ve had it) but the wall is not spongy at all. My wife had cleaned it as much as she can but it’s still there. I don’t want to sell it saying there’s no damp as I want to be as honest as possible. It’s still a great caravan and would be a great starter caravan for a family. Do you think it sounds like damp? It’s quite a large area but doesn’t bother is since we’ be owned it. What sort of money should I be asking for it? Should I ebay it or Gumtree it? Any advice would be appreciated. My 2003 sterling vitesse has what I can only describe as 4 or5 dimples or small dints on the roof above the front window.Any thoughts please? It could be tin worm – I have seen it occur many times on vans of that age. A good dehumidifier is a must have for a caravan, no matter the season or weather. I am looking to buy a 2009 caravan it seems fine ive checked and pressed walls and flooring shone a torch in under cupboards and beds etc.. all seems fine but there are some black spots on fly screens. Is this a problem I would be grateful of your advice. I am buying off a dealer but obly 3 months warranty. Thank you. I like that you mention knowing if the caravan has had repairs in the past. My dad is looking to get caravan insurance repairs done but wants tips for the future. I’ll be sure to talk to him about checking to see if the caravan had been serviced in the past. We regularly have caravan owners contacting us worried about their RV when they experience mould type smells. Often we find that the van has been leaking for a considerable amount of time and more often than not, we find that it is due to water damage due to improper fitting of accessories like solar panels, lights etc. If you are inspecting a caravan before you buy it, we suggest that you look around all accessories plus the windows, doors and skylights keeping a lookout for silicone. All quality accessories and fixtures are supplied with rubber seals to prevent water intrusion, so the need for silicone is minimal and should rarely be visible. If you are seeing large amounts of silicone on the body surface, then this could mean improper fitting.